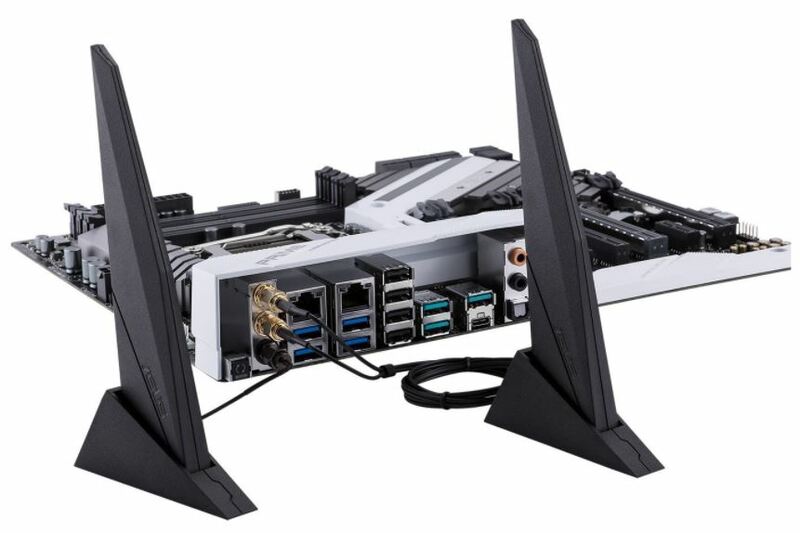 There has never been a better time to build a high-end gaming desktop. Between AMD’s showstopping 16-core Threadripper CPUs and Intel’s shockingly powerful i9 processors, consumers have a lot to choose from. Anytime Intel releases a new batch of X-series (previously known as Extreme Edition) processors; they push the boundaries of what’s possible with current technology. These changes aren’t restricted to their new chips; they also need a new motherboard to go with it. Intel has consistently lead the CPU industry, which means that most consumers on the market for a high-end CPU are eyeing up Intel’s latest processors. 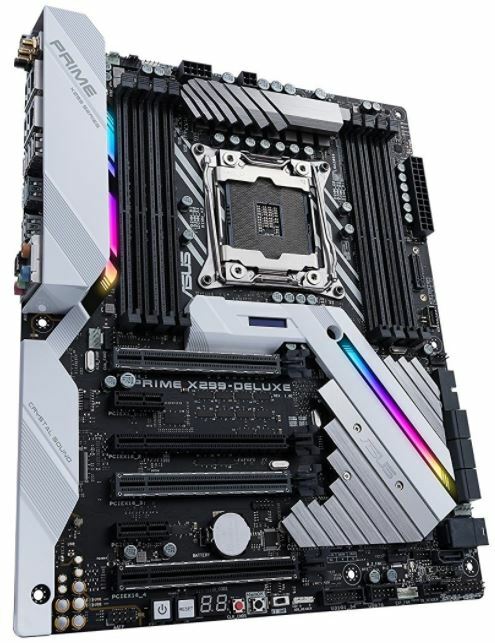 But if you want to take advantage of everything these CPUs have to offer, you’ll have to pick up an X299 motherboard. Although these motherboards have a lot in common, there are also a few key differences between them. 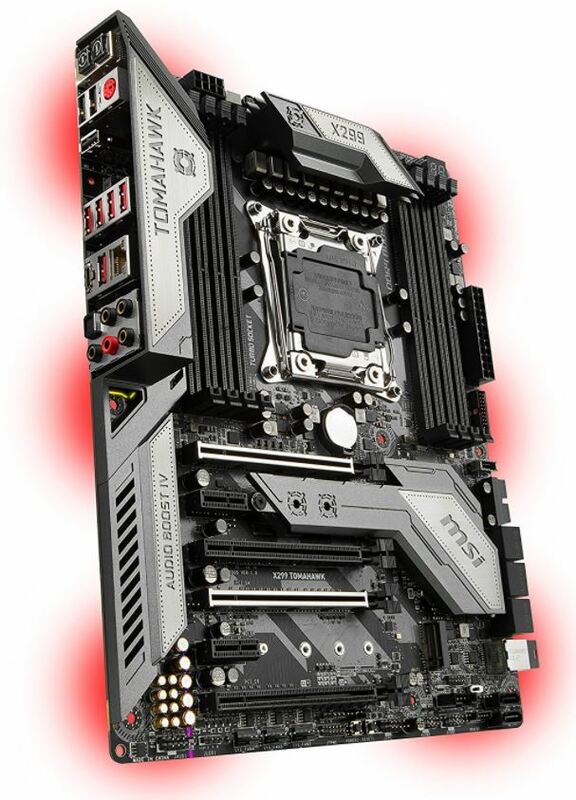 In this roundup, we’ll be taking a look at the best X299 motherboards on the market. We’ll show you what they have to offer, and help you decide which one is the best fit for your rig. Out of all the motherboard manufacturers, ASUS wanted to get the most out of X299. They released a plethora of compatible hardware, with each model supporting a varying amount of the features. Why pick the deluxe over another model? Well, this is the one that has everything. Most consumers who are planning to pick up an i9 chip aren’t willing to make compromises, and this is the board that won’t leave you lagging behind the competition. If you want a board that looks as good as it performs, you’ll be happy with the ASUS Prime X299 Deluxe. Featuring aluminum port covers and heatsinks, all of the delicate components of your board are protected from dirt, scratches, and (most importantly) heat. The bolt-on metal look is incredibly aggressive, yet the rainbow silk screening adds a peppy vibe to an otherwise eye-catching motherboard. Let’s be honest; a motherboard is going to be mounted inside your case. Looks are important, but not nearly as important as durability. Fortunately, all of the most impressive design elements are functional not just in looks, but also for durability. Take, for example, the stylish plastic ports that everything plugs into. These are made with a unique injection molding technique that encompasses a steel frame. This ensures that your PCIe slots can withstand a lot more force, something that any gamer with a high-end graphics card will appreciate. X299 offers a ton of bandwidth for your peripherals, and the ASUS X299 Deluxe makes the most of it. You’re provided with a U.2 port (yes, the “dot” is pronounced. Sorry Bono) which is a significant improvement over M.2. Originally designed for the server market, this port has found itself in enthusiast grade hardware thanks to it’s access to four PCI-Express lanes. You can think of it like SATA on crack, with bandwidth that would make a PCIe SSD cry. U.2 is still pretty new, so there aren’t a lot of devices that can take advantage of its bandwidth. This is more of a ‘future proofing’ feature, and ASUS still gives you dual M.2 slots, four PCIe x16 slots, and two PCIe 1x slots. You also have 8 DIMM slots supporting a combined 128 GB of memory. 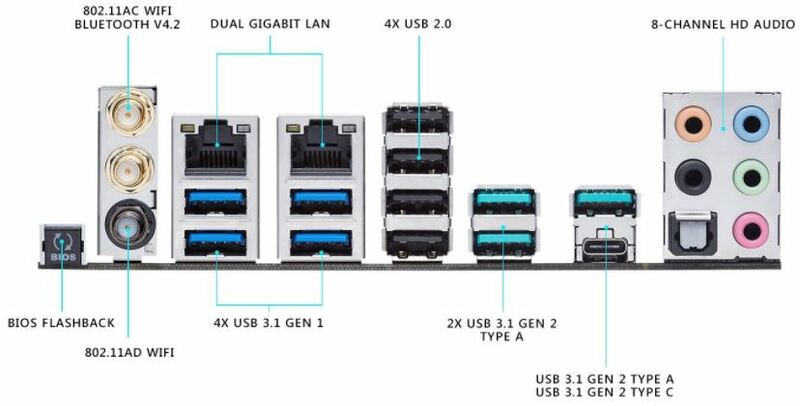 In the USB department, you get three USB-A ports and one USB-C port. Finally, you’ve got onboard wireless included as well. But this isn’t your typical integrated WiFi. It’s an 802.11ac/ad chipset, supporting the latest technologies. Even if you to buy a modern high-end network card, you likely wouldn’t see much of an improvement in networking speed. One of the most common misconceptions is that all X299 motherboards offer comparable performance. If you’re just going to slap your chip in and let it run, then this may be true. However, those of you who like to push the boundaries of your hardware will be glad you chose this motherboard. This thing is built for overclocking. In the memory department, you can push your chips to 3600 MHz. You may be able to go higher, but the board is rated for this speed. Additional tuning can vary depending on the chip you get. In many cases, it’s all luck of the draw. But ASUS offers you a 5-way optimization system that helps you balance bus speed, multiplier, fan speed, temperature, and CPU utilization to get the best performance possible under all conditions. In combination with the additional cooling we mentioned earlier, this is a board that can be pushed harder than most competing models. If you’re looking to get your game on, you need something specifically designed with the needs of gamers in mind. 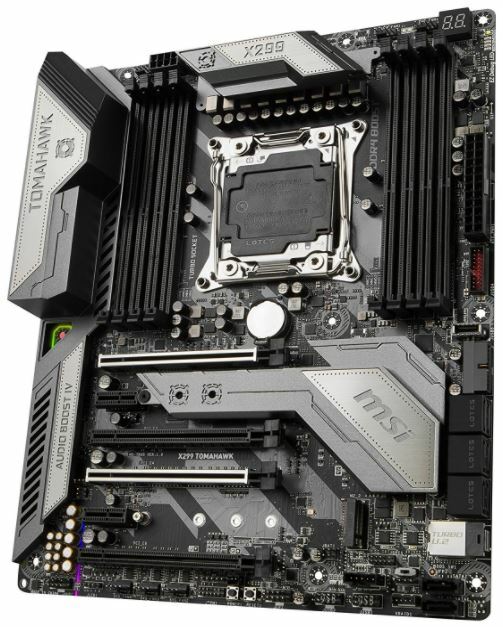 MSI’s Tomahawk motherboard has aggressive performance, and an aggressive look to match. Combined with the fact that it’s a little cheaper than some of the other options on the market, this is the number one choice for many consumers. It’s one thing to look good, it’s entirely another to look good without trying. The black and grey design of the MSI X299 Tomahawk is entirely understated, and yet you can’t help but appreciate this thing. It’s sleek and stylish, but powerful and aggressive. MSI accomplishes this through a careful balance of toning and angularity. The steel plate over the aluminum heatsink isn’t exactly high contrast, and yet this is one of the most visually appealing parts of the board. Impressively, this stunning good look doesn’t come at the expense of durability. The board offers superior cooling performance, and uses metal to reinforce all of the breakable parts of the board. There are a few unique features thrown in as well. Both of the M2 ports are protected with a metal shield, preventing both physical damage as well as RF radiation. MSI didn’t skimp on your connectivity options, allowing you to connect all of the hardware you’ve got (both new and old) to the modern PC of your dreams. It supports 128 GB of memory across 8 DIMM slots, four PCIe X16 cards for your ideal Quad-SLI system, and two more PCIe 1x slots for peripherals. For storage, you’ve got a number of options available. Those of you craving your low-profile SSD fix will want to take advantage of the dual M.2 slots, and if you live on the cutting edge you’ll be able to use the U.2 port. It also has built in support for PCIe NVMe storage, so you can use these compatible devices in whichever slot you choose. MSI’s Audio Boost system is powered by a Realtek ALC1220 chipset, providing consumers with 7.1 channels of digital audio. This is distributed through one of the two optical audio ports, or through 7 3.5mm analog outputs. Gamers looking to keep lag down tend to prefer a wired connection, and MSI doesn’t disappoint in this regard. Their Ethernet is powered by an Intel chipset designed primarily for server applications. While it’s overkill for most consumers, gamers will appreciate the improvements in lag and packet loss. On the software side, MSI provides a few features that can improve the performance in certain circumstances. The biggest benefit will be for VR gamers. Their VR BOOST technology aims to steady framerates, and prevent lag. While it might not make such a huge difference with a proper gaming monitor, this technology has shown to reduce motion sickness and improve realism in VR gaming applications. This board also offers impressive overclock performance, with an entire dedicated suite of tools that can boost memory speed to 4266 MHz, and maintain stability even under high voltage loads. Whether your new desktop is going to be put to work in mission critical applications, or you’re simply not willing to miss even a minute of gaming due to unreliable or low-grade hardware, ASUS has the board for you. The TUF series boards are, as the name implies, tough. There are two facets to this. Not only can it handle much more physical abuse than most, but it can also withstand higher temperatures without breaking a sweat. From the moment you see the ASUS TUF X299 Mark I, you’ll know that this isn’t your ordinary board. Both the top and bottom are almost completely covered with aluminum. The frame on the bottom protects all of the pins and I/O, while the top has a combination heatsink and port cover. Although the unit is fully enclosed, a honeycomb style vent cover allows air flow to move through it. The unique doored covers over the PCIe slots aren’t just for looks, they allow you to insert and remove your cards without running the risk of damage to the delicate pins. This works by guiding your cards in, so they’ll always be placed at the perfect angle. By re-imagining the PCIe slot as well as the cooling systems found on modern motherboards, ASUS has created something that can outlast almost any other board on the market. In our eyes, this was a wise decision, and can pay off big for users. Despite all of the added durability, this board is still affordably priced. They were able to accomplish this by stripping out ports that most find unnecessary, leaving only the ones you need. Despite this comparatively Spartan design, there is still plenty available. You’ve got one USB 3.1 type A port attached to a four port hub. 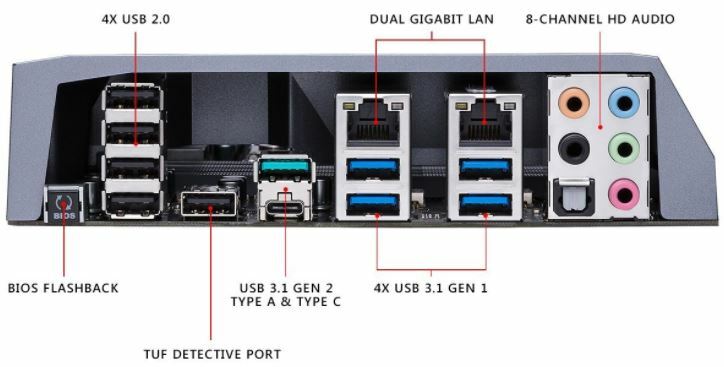 A separate, dedicated channel feeds a single USB 3.1 type C. You also get a plethora of USB 2.0 ports, and one dedicated charging port that still has power even when the computer is turned off. This board can support up to 128 GB of memory across 8 DIMM slots, and has the full suite of both analog and digital audio outputs. There is no wireless networking included, but for most gamers using Ethernet this won’t be a big deal. At standard clock rates, this board provides no better performance than any other. But where is does stand out is overclocking. Thanks to the beastly coolers found on it, you’ll have lower temperatures and higher overclocks. It’s rated for 3600 MHz memory clocks, but many consumers have been able to push it even higher. If you’re looking to push the limits of your chips and don’t have a water cooling system, this is the next best option. Part of the reason is the fact that there isn’t much integrated hardware. The lack of a WiFi chipset leaves more room for your north and southbridge to take on the heavy lifting, offloading all the work to your external cards. Although gigabyte is often considered the king of budget motherboards, they still know how to throw down at the high end. 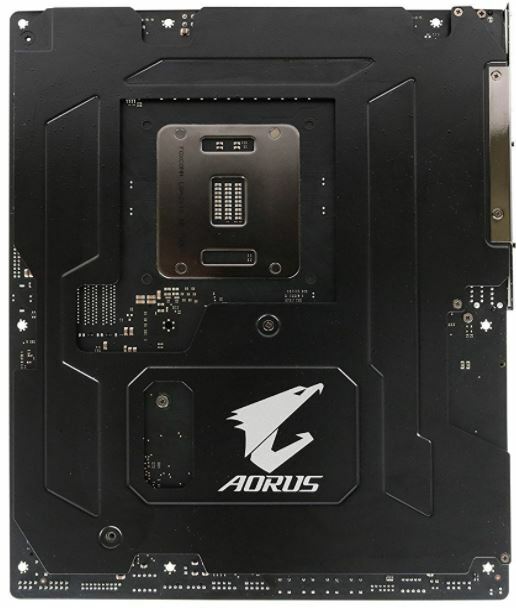 The AORUS gaming 9 is their top-tier X299 motherboard, and offers much more than many of the competing models. If nothing else, the Gigabyte X299 AORUS Gaming 9 sure is a looker. Featuring LED strips along all of the PCIe ports, DIMM slots, and the chipset cooler, this board can get your case glowing like an after hours rave. But it’s not that “in your face” RGB style lighting that’s becoming increasingly common. It’s a warm white light, and feels more like the glowing embers found in a fire. The same lighting can be found on an etched back-plate attached to the rear ports, and there is no other lighting system we could imagine that would create such a raw, powerful glow. 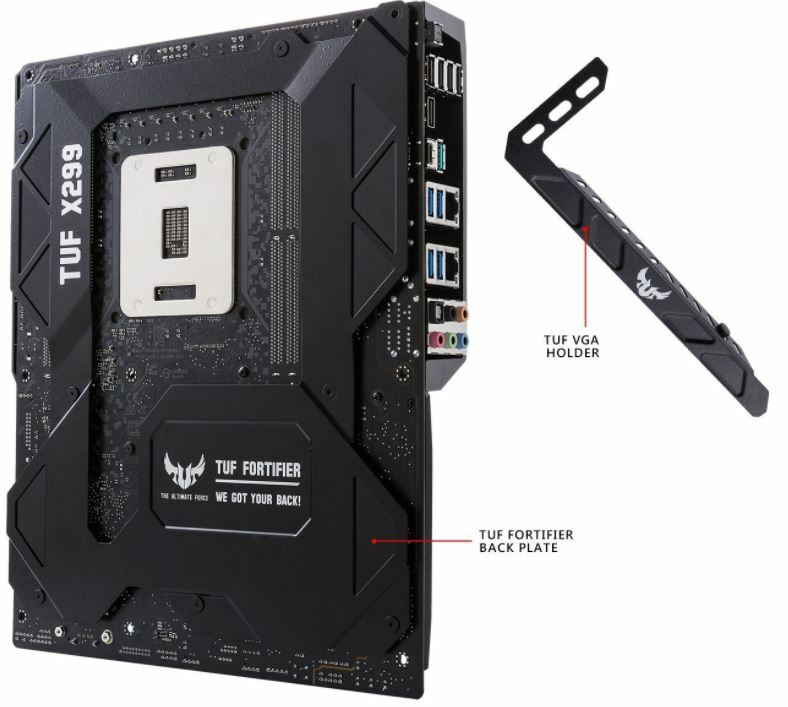 Gigabyte didn’t go too far over and above on the durability, which shouldn’t be a problem for anyone mounting this board permanently to their case. 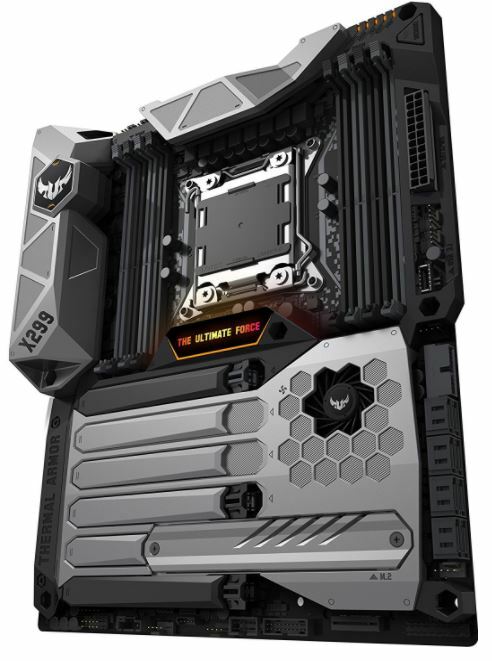 It’s got an aluminum back plate, but keeps the entire top portion of the board minimalist to support the latest water cooling systems. 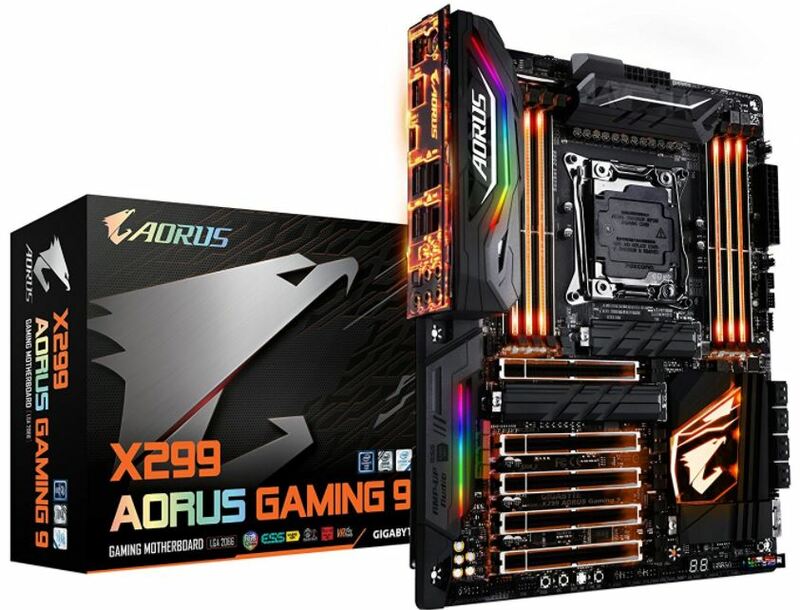 Like most of the top-tier X299 boards, the AORUS 9 has all the basics. You’ve got 8 DIMM slots supporting 128 GB of memory, USB 3.1 type C and A, and support for triple SLI. But there are a few additional features that you wont’ find elsewhere. For those of you using Ethernet networking, you’ll appreciate the ability to use bonded dual Ethernet ports to get up to 2 Gbps of bandwidth. If you prefer wireless, the onboard Killer 802.11ac WiFi connection will take care of all your needs. Overall, we couldn’t ask for a better plethora of connections. While this board can keep up with the rest of them, it isn’t really designed for overclocking. The clocks you get with this board will be a little more modest compared to others, but this won’t come at the expense of reliability. It’s got server-class power circuits, which can maintain extremely stable voltages for a very long period of time. Even if you buy a top tier chip, you won’t see performance drop over the lifetime of your hardware. 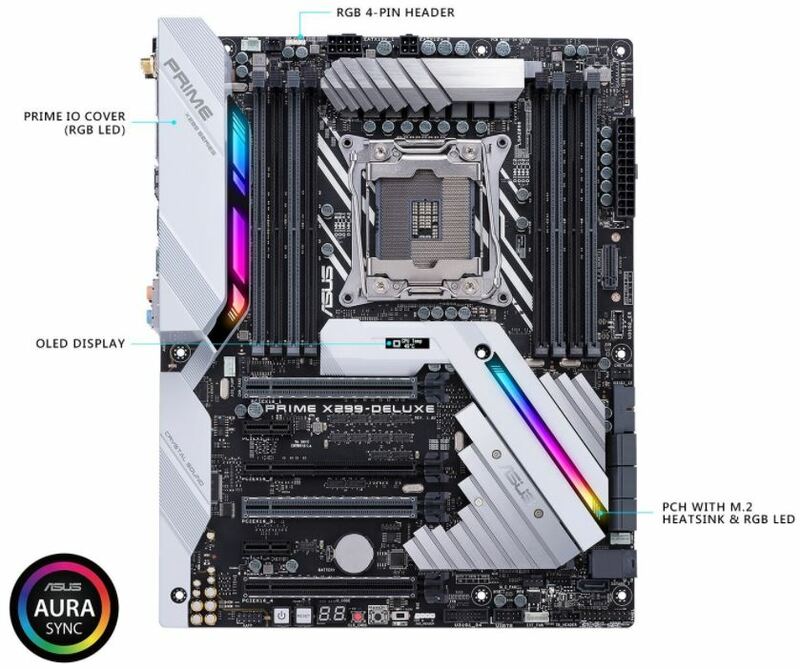 Which X299 Motherboard is Right for Me? In their own regards, each of these boards has something to offer. Which of them is the best? Well, that depends entirely on how you intend to use it. 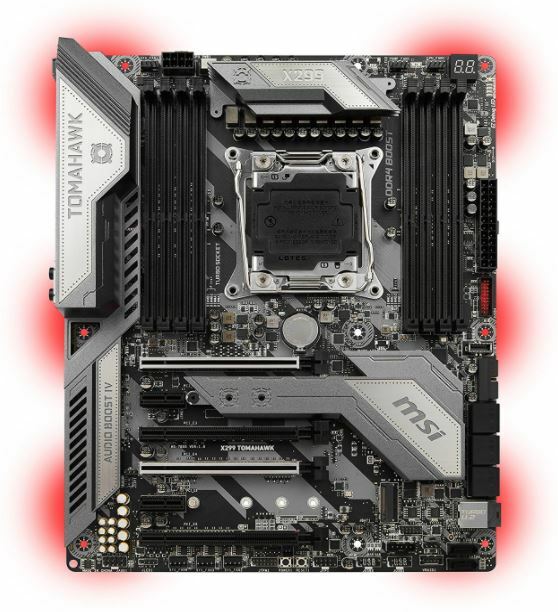 If you’re looking to overclock, the MSI X299 Tomahawk is one of the best choices out there. It’s consistently been a higher performer in memory overclocks, which would indicate that it is more stable at higher voltages, and can be pushed a little further. Alternately, maybe you’re not looking to overclock at all. Maybe you’d prefer an all inclusive system that can help you make the most of your hardware, without voiding the warranty. 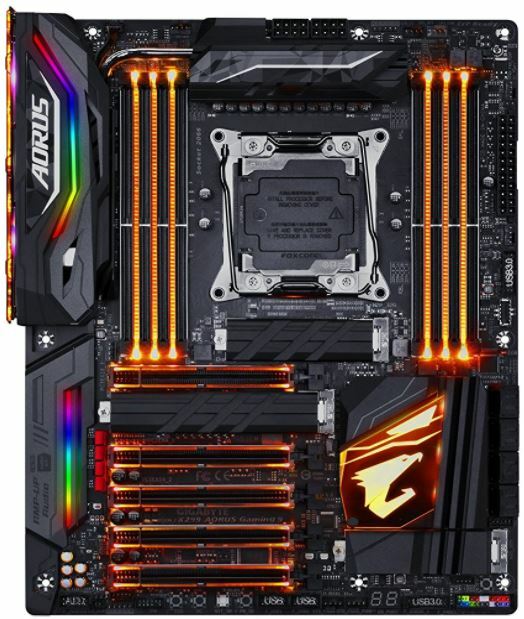 In this case, we’d suggest checking out the Gigabyte X299 AORUS Gaming 9. Not only is this one of the most stylish on the market, but it has a sever grade voltage stabilization system that can keep your system purring for years to come. Love to tweak your hardware? Find yourself constantly swapping out graphics cards, bumping up clock speeds, and doing everything you can do get a little more performance out of your system? 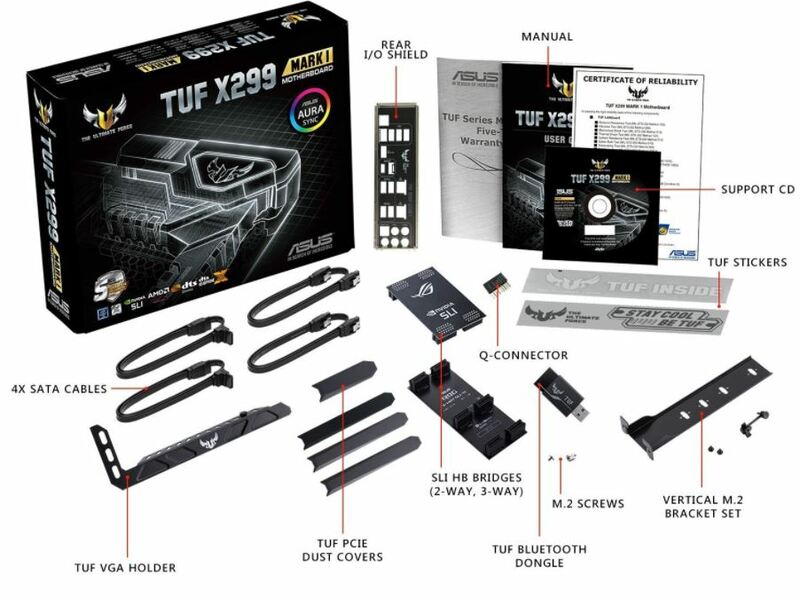 Check out the ASUS TUF X299 Mark I. This system has a full metal shield that will protect your ports when you’re changing out hardware, and it doubles as a cooler. This means better stability and lower temperatures, even when you’re pushing the limits. Want to take advantage of the latest connectivity options? The ASUS Prime X299 Deluxe is the best way to live life on the cutting edge. Featuring technologies such as 802.11ad and U.2 storage, very few boards offer the same features that ASUS provides you.